Published: Mar 2, 2013 to ? Hakka Sasakura's life is about to turn upside-down. She comes home from a day of admiring the student body president only to discover that a mysterious creature resembling a man in an animal suit has taken up residence at her home! What’s more, she's been chosen to work with this strange being to fight off invaders from another dimension and save the world... and she has to kiss him to do so?! 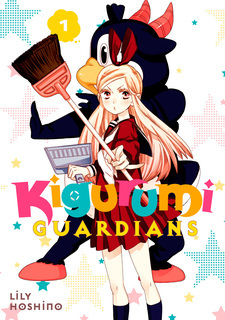 Kigurumi Guardians has been published in English by Kodansha Comics USA since August 29, 2017. When I first read the description it made me go "Why." 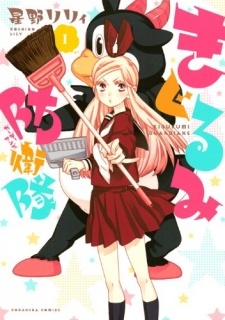 but as I read it I found the manga to be a very relaxing & funny manga. I'm not one to be for these unrealistic strange manga plots but I gave it a try & enjoyed it. The concept of these "alien"-like Kigurumi is very strange & weird but at the same time unique as this is rarely done in this manner. The plot & characters make it to be an interesting manga & all of the characters are VERY like-able & although it's pretty predictable who's going to like who, it still makes you want to read it to see how everything unfolds! My only complaint is how random the Kigurumi seem to come in the manga...even the explanation is just a quickly brushed over explanation. Whether the intention of this is to keep the manga simple & to focus on the characters instead is still unknown because there are only 4 chapters out. I do hope in future chapters it explains more about the puppets & Kigurumi. Ok don't be fooled with the cover picture! Ok to be quite honest I thought that since the cover picture looked funny, the whole story and people would be funny. Lemme just say, I was totally wrong! The story line has an amazing unique feel to it that makes you want to either laugh, be amazed, or simply fan girl! I so far NEED more chapters to come out because it's overall amazing to the point of dieing! I mean the humor is so different and so out there! The romance is way too cute, like makes you wish there were more! Ok the guys, in one word, are hottttt!!!!! The art was amazing!!! They detalized the characters and the background, if that is a word... Anyway, the art is so important factor of creating a story and an enjoyable piece of artwork to read in a manga! Couldn't get enough! As you can see I rated it as a 10 and it was mean't to be a 10 based on my standards. I loveee it and it was unique! I don't just say 10 for everything and it's such a waste if you don't give it a go! This will not be a waste of your time, instead a new opening for different types of manga! Again, don't be fooled by the picture (I think it's pretty cute though) but it doesn't fully summarize the amazing story of the manga and the romance is just too cute!!! This is an amazing romantic comedy that you cannot miss!!! Please, DON'T get scared of by the description. Ironically, the description is actually what got me into this. My friend recommended it to me, and I was in the mood for some ridiculous romance shoujo. But that, my friend, was not what I got. This manga's artwork is absolutely stunning, and the story seems stupid and silly at first glance, but there are actually a lot of secrets that are waiting to be unraveled. This manga got me so hooked on it that I reread chapters countless times waiting for updates. The expressions are amazing, and the eyes are absolutely beautiful. The emotions are portrayed so well. For the characters... there are some shoujo manga clichés that can be seen, but overall the characters are very colorful. Like for example, Nobara is a girl that appears stuck up and rich in the first chapter. At first I thought it would be a typical rival-esc character with our main heroin, but I was wrong. She turned out to be a very cute and lovable character without me even getting to chapter 3. As for the enjoyment, except for maybe one or two chapters, all the chapters made me smile. If not smile, then it really pulled me in. I really love the plot, even if the main character HAS to get involved with every single event. This is actually one of the few mangas where I can't complain with the 'main character has to be the center of all drama' plot. With all the character's colorful personalities, I would gladly see any cliché be used.